Most birthday parties, reunions and simple get-togethers with friends and family are often held in a swimming pool. It is one of the best places to relax, socialize, and cool you down during the hot summer season. To make your pool time even more fun, it’s a good idea to get some inflatable pool toys, rafts, floaties. 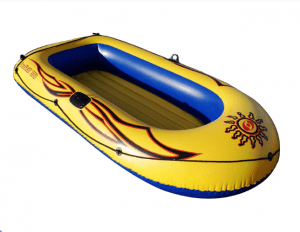 There is a wide variety of inflatable boats and floats to choose from. In this article, I will be looking at fun inflatable boats you could use in a swimming pool. Take your swimming pool experience to the next level with these fun, colorful and rideable inflatable boats. There is something about swimming pools that somehow gather the whole family. Every splash and laughter brings everyone —from the youngsters to the aunts, uncles, grandparents and even the neighbors closer than ever. Check out these pool inflatable boats fit for the family. Are you fond of riding inflatable dinghies? The Intex Explorer 300 can be a good choice. With this boat, you can enjoy a boat race with family and friends or you can just relax in it on lazy summer days. Intex Explorer 300 can accommodate up to 3 persons. 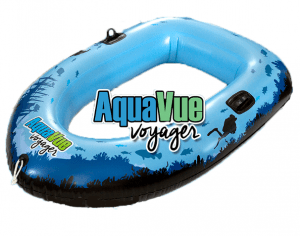 It features oar locks, a grab rope and soft inflatable floor for comfortable cruising. 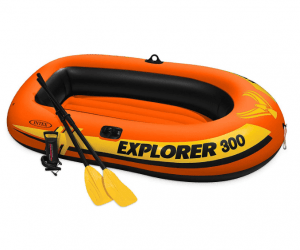 There are also the Explorer 100 and Explorer 200 which are the 1-person and 2-person inflatable boat varieties. Do you need some time to stay still and relax? The FUNBOY Giant Inflatable Pool Float might be the one for you. It offers a luxurious daybed for two, complete with a reinforced cooler and cup holders for your drinks perfect for a hot summer day. 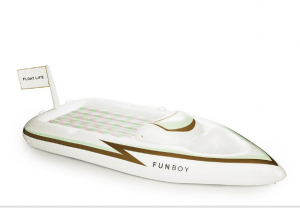 Interestingly, FUNBOY, its manufacturer provides one person one year’s worth of clean drinking water for every float purchased. Talk about doing good while doing well, right? 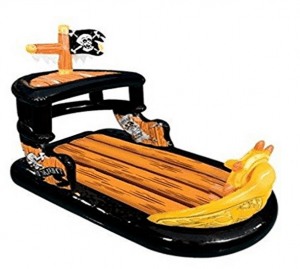 For pool playtime with the whole family, BANZAI Ahoy Matey Pirate Ship Raft Pool Float can definitely be a great addition. It is made out of durable PVC material which makes it sturdy all summer long. It can accommodate up to 150 lbs. 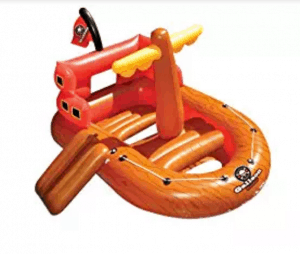 It is designed like a pirate ship complete with a steering wheel and also comes with inflatable pirate swords. This boat will make a great centerpiece at your next pirate-themed pool party. Whether you are heading to an outing or just planning to hang out in your backyard pool, Swimline Solstice SunSkiff 3-Person Inflatable Boat can surely make it a day to remember. You can read its reviews here. It can be occupied by 2 to 3 persons at a time. It comes with a grab line for passengers to hold onto to avoid falling into the water. It also has oars for rowing long distances. Get out and enjoy the sun with Bestway Kondor Inflatable Raft and Oar Set. This inflatable raft fits 1 adult and 1 child. 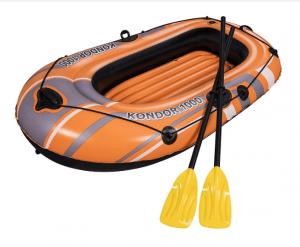 It is constructed with sturdy and reliable vinyl and features three air chambers for safety purposes, a tow rope on its bow, sturdy oarlocks and an inflatable floor for comfort. It’s a great boat for a fun and memorable time at the pool, beach or lake. You can find all its specifications and reviews here. One unique way to spark children’s imagination and creativity is by letting them play with colorful pool inflatable toys. 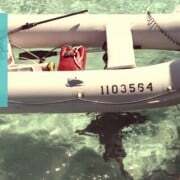 Here some of the coolest inflatable boats you can find. Just remember: never leave a child unattended near water! Looking for a boat that can fit all your kids? Aye, aye, captain! Here is the Swimline Galleon Raider Water Toy Pool Float. This huge boat can seat up to three kids and is made from heavy-duty vinyl. It comes with a gang plank and rope surround. Give your little one the chance to view what is under the water with the Sieco Design AQUAVUE Voyager Clear Bottom Inflatable Raft. This cute-sized vessel comes with fully transparent flooring so your kids won’t need to wear a snorkel mask. This boat offers them the experience of knowing what it’s like to be sitting on water. 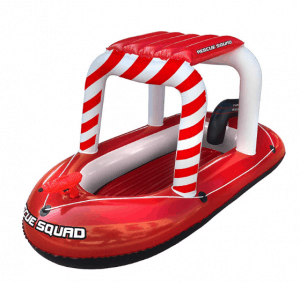 Your aspiring firefighter surely won’t be able to get enough of the Blue Wave Rescue Squad Inflatable Boat with Squirter! It comes with a ‘bimini top’-like sunshade, motor pod and a squirt gun to put out fires! It is large enough to be occupied by two young children. Its weight limit is set to 180 lbs. You can get this cool boat here! 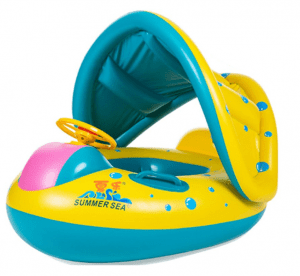 Let your kids have the time of their lives by battling, bumping into their friends as they blast them with their water blaster with the BANZAI Aqua Blast Motorized Bumper Boat. 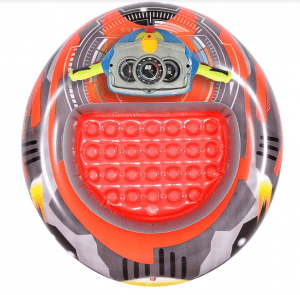 It is battery-operated and it can travel around the pool at up to 2 feet per second. This mini bumper boat can hold up to 100 lbs. It comes in blue and red varieties so your kids can team up. Most babies love the water as well, and with EncoyKid Inflatable Baby Swimming Ring with Sun Canopy, your baby will have a blast in the water. It can hold weight up to 30 lbs and has a removable sunshade, rotatable steering wheels, and a horn to amuse your little tadpole. Pool time is a blast, but remember to stay safe. Do not leave kids alone around the water!